• Taekwondo, meaning "the way of the hand and foot," is a general term used to describe Korea's national sport. We train in a traditional Korean forms. We supplement these punches and kicks with self-defense techniques and overall endurance and flexibility training. • Karate training takes place in a formal atmosphere with an emphasis on etiquette and self-control as well as physical ability. Training generally is divided into the practice of basic techniques and sparring. While sparring, students stop blows just short of contact so that power is always maintained with control. • Aikido is a Japanese martial art involving a wide range of throws, joint locks, and takedowns. Aikido does not focus on punches and kicks, but rather on how to deflect the impact of punches and kicks. ​Erin L. Kahn grew up in southern Delaware with a passion for horses. At the age of 9 her father gave her the gift of riding lessons from a local instructor. She started teaching horseback riding to young students around the age of 15. While attending the University of Delaware she taught children riding as a part-time job. After graduating from college in 1999, with a degree in Anthropology and History, Erin moved to Connecticut with the hopes of working as an Anthropologist at the Pequot Museum in Ledyard. Unable to secure a job at the museum, Erin took a position as an assistant manager at a local pet store, where she spent many years working with the public on animal care and maintenance. During her time at the pet store Erin had 2 children, Benjamin and Emily. After having both children Erin took a job as a preschool teacher and eventually started working for 4-H at the University of Connecticut teaching elementary school students in local schools. 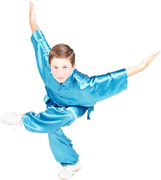 When Ben was 6 years old he asked to start karate. Thinking it would be good for his self confidence Erin enrolled him at Black Bear Dojo, just a few miles up the road from her house. Having tried karate as a child and wanting to give it a second chance, Erin decided to become a student as well. Erin has now been practicing Reihokan Shorin-Ryu karate for almost 6 years. 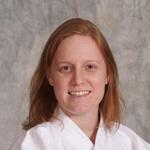 Erin has been teaching at Black Bear Dojo since 2013 when she received her Shodan in karatedo. Having an extensive background, especially in teaching children, Erin has become the primary teacher for both children's classes, Tigers and Lions, and is assistant teacher with the STORM and Adults classes. She also is the assistant teacher in Kobudo. Erin continues to support her training both in the dojo as a student and participating in seminars around the world. Most recently she was asked to demonstrate with Spear Sensei in the famous Okinawan Budokan in Naha and was part of the Guinness Book of World Records Karate Kata Event. She has visited Okinawa 4 times to train with Hanshi Naonobu Ahagon. Erin is one of the few students that has tested in Okinawa in front of Ahagon Hanshi. Erin thoroughly enjoys the Okinawan culture and people. Her love for history has carried over to studying Okinawa and the history of martial arts.